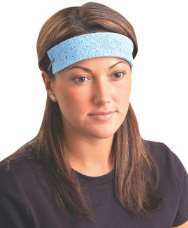 Cooling, absorbent, dry sponge sweatbands provide cooling relief. Just dip in cold water to soften, squeeze out excess water and wear. Affixes with rubber band.